6 European composers will each create a part of a grand opera on the myth of the fall of Lucifer. Intimacy and trembling emotions will transform the tangible reality into magic and opera. The world has become transparent – a shattered mirror where our real lives are only displayed in fragmented glimpses – we seek out authenticity, intimacy and grand emotions – we have gadgets and filters to assist us in constantly seizing, accentuating and sharing the authentic and real parts of our lives. At the same time we have lost our perspective. Reality quickly changes, erodes, and leaves us – man – alone with an overwhelming powerlessness and in a state of free fall. Along with Ensemble Musiques Nouvelles, sopranos Annemette Pødenphandt and Camilla Løvstad and countertenor Daniel Carlsson the participating composers enter the stage as themselves. Dazzled by the stage lighting the will be on display in the midst of their own work! With this concert, OPERATIC ACTIONS, Musiques Nouvelles (BE), Operomanija (LT) and AUT – Aarhus Unge Tonekunstnere (DK) – will be initiating a new European collaboration with the intent to develop the genre chamber opera. Opera is one of the most exciting live arts media of our time. 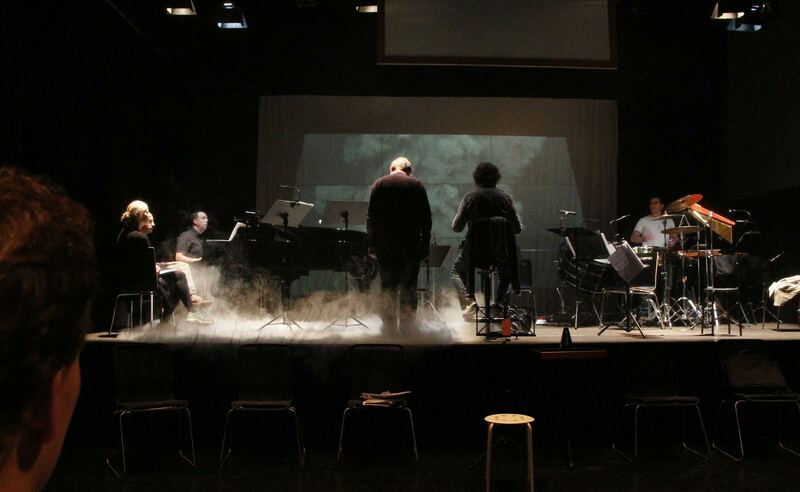 Opera flourishes in a free and radical innovation of the Wagner-inspired ”gesamtkunstwerk”. It is an emotional and sensuous art form which addresses the larger questions in the human existence. The concert will be repeated in Belgium on June 6th 2015 in Mons, European Capital of Culture 2015. Musicians: Musiques Nouvelles (BE) (Laurent Houque (violin), Jean-Pol Zanutel (cello), Pierre Quiriny (percussions), Charles Michiels (clarinet) & André Ristic (piano)), Christian Tscherning Larsen (trombone, DK), Daniel Carlsson (countertenor, SE), Annemette Pødenphandt (soprano, DK) & Camilla Løvstad (soprano, DK). Production: AUT – Aarhus Unge Tonekunstnere – in cooperation with Musiques Nouvelles og Operomanija.